This past weekend my little family took a road trip out to the Okanagan to witness and celebrate a marriage of some much-loved family. Heading off Salt Spring to the mainland, at least one trip via BC Ferries is necessary for us island-bound folk. Now, having become a seasoned ferry traveller over the past 8 years of island and coastal living, the thrill of the ferry ride is all but gone for me. The seats aren’t that comfortable, the car deck is often dark and noisy, the lines for food are always a mile long, and the whole thing is far too expensive. Fortunately, there is still one thing I look forward to when I’m aboard the giant vessels: there are always some pretty intriguing books. Being the cheap thrifty person I am, I don’t often spend money on buying books when I know I can borrow them for free from the library. However, I’ve had such positive experiences with the books I’ve bought on BC Ferries in moments of boredom and failure to remember to bring reading material, that I have become accustomed, and look forward to, finding a new book to call my own from the ferry gift shop. This trip, again, one book in particular caught my eye, having had a friend mention it out of the blue just days before: The Life-Changing Magic of Tidying Up by Marie Kondo. The subject matter isn’t something I’d generally pick up, preferring true adventure stories or thought-provoking novels, but I had to admit that instruction on how to declutter and purge my home could be extremely useful for my busy, lazy, disorganized self. So I purchased the book and set to reading. I was surprised to find how much this book seemed to be speaking directly to me. In awe of the extreme, long-term focus of the author, I kept thinking about the synchronicity of a million things that seemed to make now the perfect time for me to find everything falling in place to not only find this book, but for my mind to be ready to really receive the words that would allow for change. In the course of the three-day journey I eagerly gobbled up more than half of the book. Now that I’m home, I will continue to read on, but I am also starting to put what I’ve learned into practice. 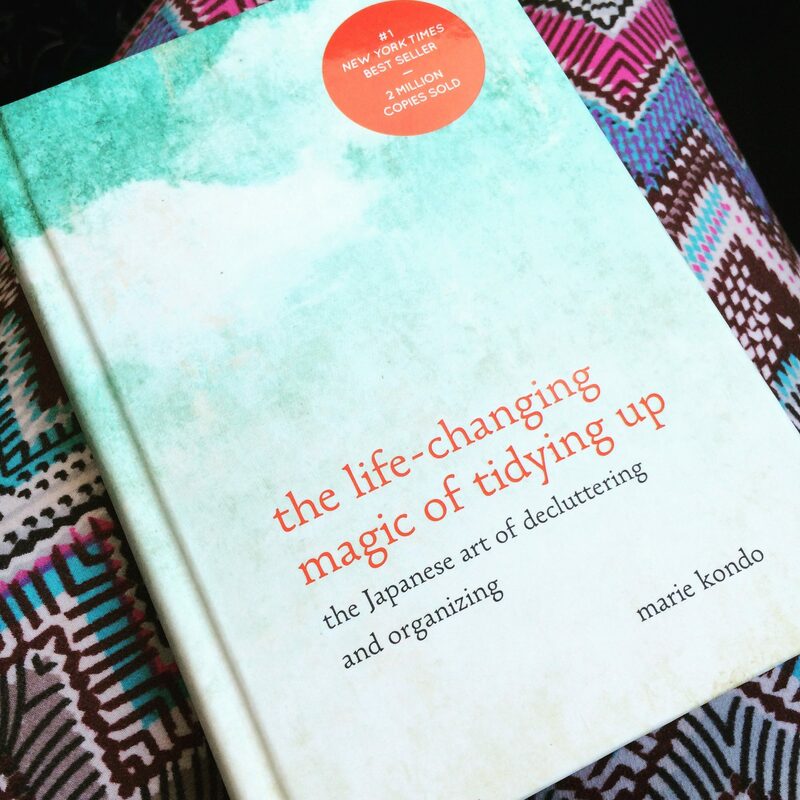 As a very brief overview of the book (or what I’ve read of it so far) suggests that we can eliminate clutter and the need for constant tidying by following through with the KonMari Method. This method entails going through every item you own, in a specifically detailed sequence, and keeping only those things that spark joy within oneself. Things that you actually treasure. The best of your best. In doing so – allowing only the items that bring you joy by simply being a part of your life to stay in your home – you open yourself to seeing what it is you really want in life, and you are able to go out and make that happen. The clutter of your home is gone, and with it goes the barriers of not letting go of what doesn’t make you happy. We tend to keep a lot of things for sentimental value, because we are not able to let go of the past and old intentions that no longer suit us. Letting go of the stuff also helps us let go of what we mentally attached to the stuff. Before you can start purging what doesn’t elicit joy, Kondo says it is very important to visualize what kind of a life you hope to have. This way, you have a better focus on the kind of things you want to include in your new life. The more detail the better, and one should continue asking “why?” and digging deeper to understand what it is that they truly want in their life. Getting started on putting the KonMari Method into place in my own life, I chose to create a vision board. I had started cutting little pieces of magazines out in a past attempt to make a vision board, and even pasted one on to a large piece of paper, so I gathered up the abandoned attempt and set to work creating a poster that would help me focus on the life I want to live. Perhaps I’ll share my vision board with you in another post. I feel like it deserves it’s own space. I can’t wait to have my things and my life sorted out. What a huge relief it will be to have my mind clear, and practiced at deciding what goes and what stays. What to let go of, and what to embrace. If you are interested in following along with my experience of trying the KonMari Method of tidying up, follow me on Instagram (or Facebook or Twitter). I will be using the hashtag #mykonmarilifechange to document my journey to a simpler, more focused life.